#194, drawn by Ty Templeton, is seemingly a one-shot which introduces Uncle Ernst, a supervillain from Marc Spector’s childhood. #195-196, with brilliant artwork by Paul Davidson, is a weird and charming little story about The Collective, a new supervillain (or group of villains?). #197-198, drawn by Jacen Burrows again, seem to tell a very similar tale about another group of adversaries, the Société des Sadiques. Their leader turns out to be none other than Uncle Ernst, which in hindsight makes #194 the first part of this story arc. Although the story appears to be finished with #198 (which is also the last issue to be collected in the TPB, “Phases”), #199 (art by Davidson again) continues it with another face-off between Moon Knight and Ernst. #200 (still drawn by Davidson), finally, brings back the supervillains from the previous arc, Sun King and The Truth, the former allying with Moon Knight while the latter has been corrupted by Ernst. Thus, with the interruption of #195-196, we basically have a five-part finale, the cohesion of which is futher damaged by the change of artists. Bemis has injected a lot of clever and darkly humorous ideas into these issues, though their connections to the Nazi Holocaust are sometimes bordering on tastelessness. Still, the cancellation of this series after this anniversary issue is a remarkable marketing failure, even for Marvel. Usually, such an anniversary would be used to invigorate and generate new interest in a series at least for the next couple of issues (which has recently worked well for e.g. Action Comics at DC), but Marvel didn’t even seem to have had that much faith in Moon Knight. The 200th issue itself is not that flashy either: a slightly increased size (30 pages) for an increased prize ($5), some guest artist pages (one each by Jeff Lemire and Bill Sienkiewicz), and an action sequence of two double-page spreads by Davidson – that’s it. What remains in memory of this Bemis/Burrows/Davidson run is a number of whacky characters, stunningly drawn panels, witty lines of dialogue, and ways of storytelling that at least feel fresh. And three comic creators to watch (although Bemis seems to identify more as a rock musician). However, the lack of success of a rock-solid series such as Moon Knight also says a lot about the current state of American superhero comics in which such a vast amount of material is published each week that the comic books are cannibalising each other in their competition for reader attention. Regular readers of this weblog might have gathered from earlier posts that the two previous Moon Knight incarnations, the Ellis/Shalvey run and particularly the Lemire/Smallwood run, ought to be regarded as highlights of the superhero genre of this decade. Now that the first storyarc in the first six issues of the latest Moon Knight run (#188-193 in the annoying new “Legacy” numbering) has been completed, it’s time to ask: how does it hold up? It’s reassuring to read that Bemis and Burrows decided to honour the – ahem – legacy of Moon Knight instead of wiping the slate once again, as some previous Moon Knight authors have done. 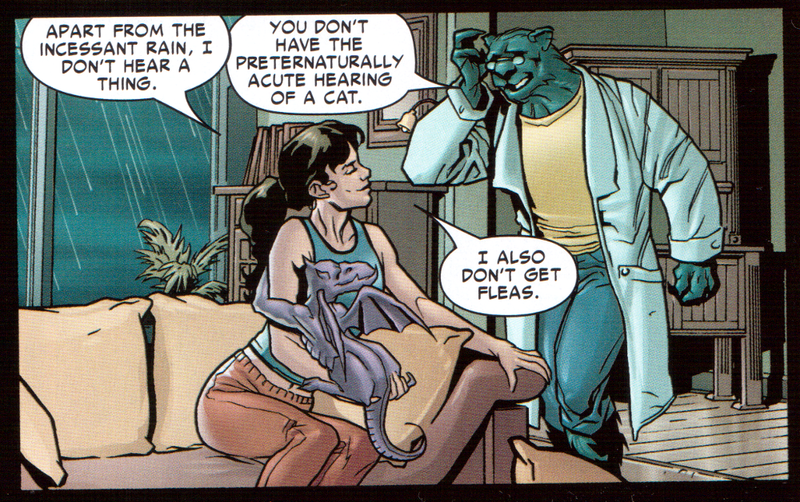 The first issue (#188) is even entirely told from the perspective of Dr. Emmet, Marc Spector’s psychiatrist, a character created only recently by Lemire and Smallwood. Telling a story about a character from the perspective of his or her psychiatrist isn’t a new device. Neither is the introduction of an ‘evil twin’ sort of villain, a character similar to Moon Knight who is set up as his rival. However, combining these two devices to the effect that Moon Knight himself doesn’t directly appear in the whole first issue is quite a daring move. The second issue (#189), however, introduces another villain, “The Truth”, who is chased and confronted by Moon Knight. The concept of Moon Knight’s split personality disorder (Marc Spector / Steven Grant / Jake Lockley) is expanded to the effect that he now, more deliberately than before, switches between his personalities so that he has e.g. Jake Lockley do all the dirty work. Jake is the personality that contains Moon Knight’s darkest, most violent and ruthless aspects, from which the other personalities are kept clean. In #190, Jake and Marc have a conversation about this in his (their?) mind. Jake says, “Kid, you sliced me off your personality and sent me to live among freaks, addicts, and criminals. There are things you don’t want to know. […] Look. Steven is the wealthy benefactor. Khonshu is our connection to the bigger picture. You’re the voice of reason. And I deal with the grimy leftovers. You built us this way.” Just how great the divide between these personalities is becomes clear later in this third issue, when Marc visits his ex-girlfriend Marlene and finds out that, unbeknownst to him, as it were, she had been dating Jake instead after having split up with Marc. Khonshu does a lot of talking too, as he is the narrator for most of this story. In #191, he dispenses a peculiar theological lecture to Moon Knight in which he suggests that the Lovecraftian Old Ones, the Judeo-Christian God, and Ancient Egyptian Ra (father of Khonshu) are one and the same. However, as always, we can’t be sure whether Khonshu is really a supernatural individual or just another aspect of Moon Knight’s twisted mind. So the writing is a mixed bag of good and not so good ideas. As for the art, it’s more than solid, even beautiful. Jacen Burrows’s style is perhaps best compared to Frank Quitely’s, with its thin clear outlines and little shading. However, while there are many clever compositions and layouts to be found here, Burrows’s art lacks the groundbreaking creative force and the eagerness to experiment for which his predecessors on the title, Smallwood and Shalvey, will be remembered. An unfair comparison, perhaps, but unavoidable. Nevertheless, I’m looking forward to finding out where Bemis and Burrows are going to take Moon Knight – this still has the potential to turn into another historic run. Thanks to Marvel’s ‘Legacy’ reboot, a new Moon Knight series with a new creative team has started recently (more on that in a later blogpost). The last 5 issues of the Lemire/Smallwood run have been collected as trade paperback vol. 3: “Birth and Death” (even though the story arc is titled “Death and Birth” in the individual comic books), and if there was any justice in the world, this comic would now show up on all of those year-end best-of lists for 2017 (it doesn’t – more on that in a later post). For what it’s worth, here’s why you should read it anyway. Previously in Moon Knight: Marc Spector has escaped the mental asylum, but his friend Crawley is being held captive by the god Anubis. 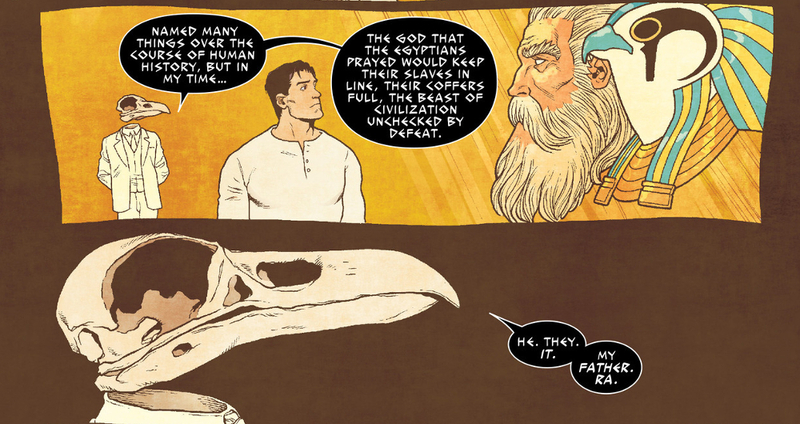 And Moon Knight has yet to confront Khonshu, the god who created him. In the beginning of this new story arc, Moon Knight seeks out Anubis. They strike a deal: if Moon Knight succeeds in rescuing Anubis’s wife Anput from the Overvoid (a parallel dimension reminiscent of ancient Egypt, except that people ride on giant dragonflies through the air and pyramids float above the ground), Crawley will be released. This story is intertwined with another, Moon Knight’s origin, the two strands alternating in segments of 3-6 pages each. The flashback to Moon Knight’s past starts early, in Marc Spector’s childhood. We learn that already back then he created an imaginary friend (or so his psychiatrist says), Steven Grant, who later becomes an aspect of his own personality. And Marc is already visited by Khonshu who introduces himself as Marc’s real father. Later, we see Marc as a U.S. Marine in Iraq when he gets dishonorably discharged because of his mental illness. He stays in the region and becomes first an illegal prizefighter, then a mercenary. On a mission to plunder an archaeological excavation site “near the Sudanese-Egyptian border”, he turns against his employer, Bushman, when the latter ruthlessly kills the archaeologists. Spector is defeated by Bushman and left to die alone in the desert, but Khonshu resurrects him. Then we’re back in the present again and Marc faces Khonshu. I won’t spoil the outcome of this confrontation, but let’s look instead at that last transition from past to present in detail: in issue #14, p. 4 we’re in the desert in Marc’s past. Then on p. 5, Moon Knight in his ‘Mr Knight’ persona in the white suit is in the mental asylum again. He enters a room where he is greeted by his “good friends Bobby and Billy and Doc Ammut” – hybrid creatures of asylum staff and mythological figures. They subdue Mr Knight and give him an injection which knocks him out. As past and present are about to fuse, the middle axis of the page no longer serves as a mirror axis that separates the two columns in the 2 × 3 panel layout of p. 6 in Moon Knight #14. Also note on the right panel how the hospital couch onto which Marc is fixated to undergo eletroconvulsive therapy has turned into an Ancient altar. This is the most (delightfully) confusing and metafictional transition sequence, but there are many more of these mind-bending moments in this comic, and they are the main reason why it’s so brilliant. Add to this all the clever design, layout, composition and colouring decisions that Jeff Lemire, Greg Smallwood and Jordie Bellaire have made and you get one of the most remarkable superhero comics in recent history. The Champions #10 ‘controversy’: Did Mark Waid defend internment camps? I’ll have to think twice before buying any more Mark Waid comics, and I say that as someone who’s been a fan of his for almost 25 years. As a regular reader of both Aaron Kashtan’s weblog and Mark Waid’s comics, I had to check out this comic book for myself. Aaron’s problem with Champions #10 is that writer Mark Waid “defends” the fictitious internment camp in which most of the story is set (or maybe even internment camps in general?) and portrays it in an insensitive manner. Several other people have shared this sentiment on the Internet, e.g. Joe Glass at Bleeding Cool, but not that many to qualify it as a full-blown outrage. Anyway, here’s how I see Champions #10, and please note that this is only about the comic and not about the opinions of Aaron Kashtan or Joe Glass or Mark Waid (who identifies himself as a “liberal” and “progressive” writer for what it’s worth). In the current status quo of the Marvel universe at the time of Champions #10, the villainous organisation Hydra has taken over the United States, and Inhumans (basically a superpowered alien race living among humans) “are being imprisoned in camps across the country”, as the introductory text puts it. The first three comic pages show life in one of these camps in a nutshell: behind the idyllic appearance, a surveillance regime is in operation in which merely talking about escape can get inmates killed immediately. So far, so good, but then Hulk comments (still on p. 14): “Trust me, as an Asian American, I have a deep historical hatred for internment, but we might have to retreat and try some other–“. This is the crucial point (the rest of the story is of no importance here): Hulk’s comment links the fictitious camp to real-world history. Even though (or rather because) he doesn’t really say much, it triggers questions in the reader’s mind such as whether Hulk thinks that the US government that imprisoned Japanese Americans (and also Korean Americans – Amadeus Cho is of Korean descent) in WWII is morally as bad as Hydra, or whether he feels that the conditions of living are as bad in the camp he is standing in as they were in WWII internment camps. Such ideas might be offensive to Asian Americans – but they are not explicitly expressed in the comic. 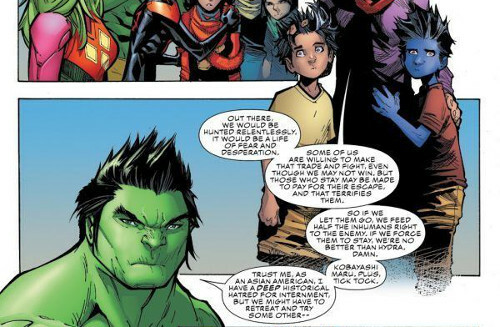 (Who knows, maybe Hulk is merely thinking, it’s wrong to imprison someone because of his or her race, then and now.) Even if they were, it would be Hulk who has these controversial opinions, not Mark Waid. In the end, Amadeus Cho is only a teenager who hasn’t experienced WWII internment camps, so why should his opinion have such a weight that it could be mistaken for the ‘message’ of the whole comic or its writer? 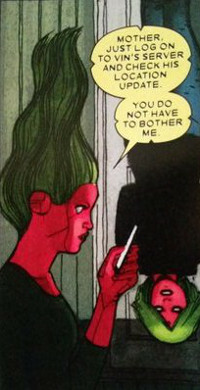 Waid could have devised a better stand-in for himself to broadcast his opinion, if that had been his aim. Besides Hulk’s comment, is the plot point itself offensive that some of the inmates choose to stay imprisoned in this particular camp rather than break out? How can Ms. Dawood say she is safer inside than outside the camp when she all but witnesses the execution of two other prisoners? One could argue that, once outside the camp, Inhumans would have a good chance of escaping and hiding from Hydra by using their superpowers. However, the inmates are probably safer inside the camp, for as long everyone plays by the rules and doesn’t try to escape, no one is executed. This is an important difference from real-world Nazi concentration camps, many of which were death camps with the purpose of ultimately killing all inmates. Ms. Dawood is also right about “being well cared for”: from what we see of the Inhuman camp, it looks like they live in spacious, well-kept houses with their own lawns. This is an important difference from real-world Asian American internment camps in WWII, in which conditions were miserable. However, the problem of Champions #10 lies not in the story but in how it is told. The comic has a serious problem with its pacing and crams too much action into too few pages. The situation of the Inhuman inmates and the opinions of their two conflicted groups are relayed mainly through the Champions instead of the Inhumans themselves, because they have already turned into a raging mob and are busy fighting each other. It’s also telling that – after the camp wall has been breached and the guards have been taken out – it’s up to the Champions to come up with a solution to the problem of approaching Hydra reinforcements. The Inhumans, even though they have superpowers too, are relegated to passive victims in need of rescue. 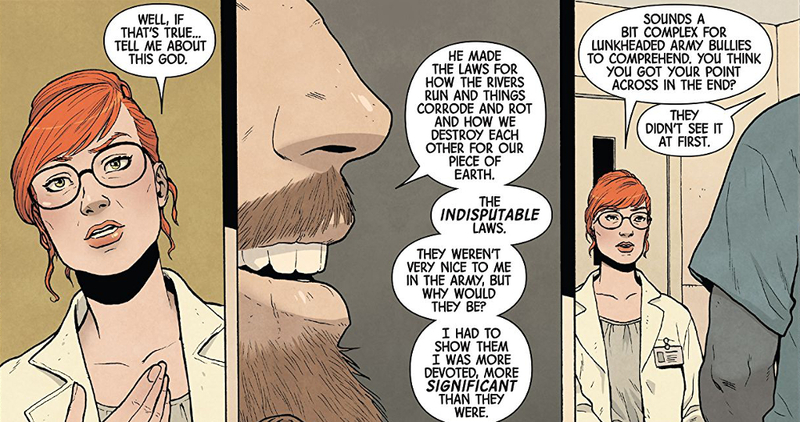 And even though there are “hundreds” of inmates in the camp, the Champions only ever talk to two of them (not counting the terrified Inhumans they first meet on p. 10), so the majority of the Inhumans – despite their portrayal as heterogeneous – lack not only agency but also their own voices. To sum up: is it allowed to allude to real-world internment camps in a superhero comic book? Of course it is. But if the comic is poorly written and the subject matter is not treated with the necessary sensitivity, don’t be surprised if people are offended. That being said, this whole ‘controversy’ seems to be a non-issue along the lines of Action Comics (2011) #1 / “GD” and Batgirl (2011) #37 / “But you’re a–“ (both of which I haven’t read though). Latent Dirichlet Allocation (LDA) is one of the most popular algorithms for Topic Modeling, i.e. having a computer find out what a text is about. LDA is also perhaps easier to understand than the other popular Topic Modeling approach, (P)LSA, but even though there are two well-written blog posts that explain LDA (Edwin Chen’s and Ted Underwood’s) to non-mathematicians, it still took me quite some time to grasp LDA well enough to be able to code it in a Perl script (which I have made available on GitHub, in case anyone is interested). Of course, you can always simply use a software like Mallet that runs LDA over your documents and outputs the results, but if you want to know what LDA actually does, I suggest you read Edwin Chen’s and Ted Underwood’s blog posts first, and then, if you still feel you don’t really get LDA, come back here. OK? I like to eat broccoli and bananas. I ate a banana and spinach smoothie for breakfast. Chinchillas and kittens are cute. My sister adopted a kitten yesterday. Look at this cute hamster munching on a piece of broccoli. We immediately see that these sentences are about either eating or pets or both, but even if we didn’t know about these two topics, we still have to make an assumption about the number of topics within our corpus of documents. Furthermore, we have to make an assumption how these topics are distributed over the corpus. (In real life LDA analyses, you’d run the algorithm multiple times with different parameters and then see which fit best.) For simplicity’s sake, let’s assume there are 2 topics, which we’ll call A and B, and they’re distributed evenly: half of the words in the corpus belong to topic A and the other half to topic B. Which topics are the other tokens in this document assigned to? Probably the document is about one single topic, so if all or most other tokens belong to topic A, then the token in question should most likely also get assigned to topic A. Which topics are the other tokens in *all* documents assigned to? Remember that we assume a 50:50 distribution of topics, so if the majority of tokens is assigned to topic A, the token in question should get assigned to topic B to establish an equilibrium. If there are multiple tokens of the same lemma: which topic is the majority of tokens of that lemma assigned to? If most instances of ‘eat’ belong to topic A, then the token in question probably also belongs to topic A. The actual formulas to calculate the probabilities given by Chen and Underwood seem to differ a bit from each other, but instead of bothering you with a formula, I’ll simply describe how it works in the example (my understanding being closer to Chen’s formula, I think). Let’s start with the first token of the first document (although the order doesn’t matter), ‘like’, currently assigned to topic A. Should ‘like’ belong to topic B instead? If ‘like’ belonged to topic B, 3 out of 4 tokens in this document would belong to the same topic, as opposed to 2:2 if we stay with topic A. On the other hand, changing ‘like’ to topic B would threaten the equilibrium of topics over all documents: topic B would consist of 12 tokens and topic A of only 10, as opposed to the perfect 11:11 equilibrium if ‘like’ remains in topic A. In this case, the former consideration outweighs the latter, as the two factors get multiplied: the probability for ‘change this token to topic B’ is 3/4 * 1/12 = 6%, whereas the probability for ‘stay with topic A’ is 2/4 * 1/11 = 4.5%. We can also convert these numbers to absolute percentages (so that they add up to 100%) and say: ‘like’ is 57% topic B and 43% topic A. What are you supposed to do with these percentages? We’ll get there in a minute. Let’s first calculate them for the next token, ‘eat’, because it’s one of those interesting lemmata with multiple tokens in our corpus. Currently, ‘eat’ in the first document is assigned to topic B, but in the second document it’s assigned to topic A. The probability for ‘eat stays in topic B’ is the same as the same as for ‘like stays in topic A’ above: within this document, the ratio of ‘B’ tokens to ‘A’ tokens is 2:2, which gives us 2/4 or 0.5 for the first factor; ‘eat’ would be 1 out of 11 tokens that make up topic B across all documents, giving us 1/11 for the second factor. The probability for ‘change eat to topic A’ is much higher, though, because there is already another ‘eat’ token assigned to this topic in another document. The first factor is 3/4 again, but the second is 2/12, because out of the 12 tokens that would make up topic A if we changed this token to topic A, 2 tokens would be of the same lemma, ‘eat’. In percentages, this means: this first ‘eat’ token is 74% topic A and only 26% topic B. In this way we can calculate probabilities for each token in the corpus. Then we randomly assign new topics to each token, only this time not on a 50:50 basis, but according to the percentages we’ve figured out before. So this time, it’s more likely that ‘like’ will end up in topic B, but there’s still a 43% chance it will get assigned to topic A again. The new distribution of topics might be slightly better than the first one, but depending on how lucky you were with the random assignment in the beginning, it’s still unlikely that all tokens pertaining to food are neatly put in one topic and the animal tokens in the other. The solution is to iterate: repeat the process of probability calculations with the new topic assignments, then randomly assign new topics based on the latest probabilities, and so on. After a couple of thousand iterations, the probabilities should make more sense. Ideally, there should now be some tokens with high percentages for each topic, so that both topics are clearly defined. Topic 0 is clearly the ‘animal’ topic here. 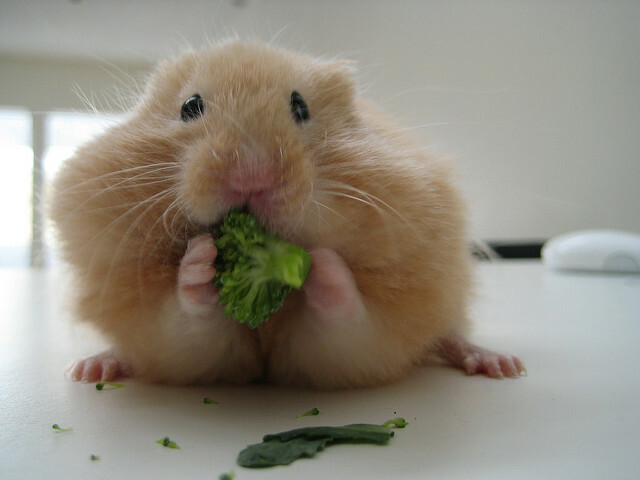 Words like ‘broccoli’ and ‘much’ slipped in because they occur in the mixed-topic sentence, “Look at this cute hamster munching on a piece of broccoli”. No idea why ‘spinach’ is in there too though. It’s equally puzzling that ‘adopt’ somehow crept into topic 1, which otherwise can be identified as the ‘food’ topic. The reason for this ostensible failure of the LDA algorithm is probably the small size of the test data set. The results become more convincing the greater the number of tokens per document. For a real-world example with more tokens, I have selected some X-Men comics. The idea is that because they are about similar subject matters, we can expect some words to be used in multiple texts from which topics can be inferred. This new test corpus consists of the first 100 tokens (after stop word removal) from each of the following comic books that I more or less randomly pulled from my longbox/shelf: Astonishing X-Men #1 (1995) by Scott Lobdell, Ultimate X-Men #1 (2001) by Mark Millar, and Civil War: X-Men #1 (2006) by David Hine. All three comics open with captions or dialogue with relatively general remarks about the ‘mutant question’ (i.e. government action / legislation against mutants, human rights of mutants) and human-mutant relations, so that otherwise uncommon lemmata such as ‘mutant’, ‘human’ or ‘sentinel’ occur in all three of them. To increase the number of documents, I have split each 100-token batch into two parts at semantically meaningful points, e.g. when the text changes from captions to dialogue in AXM, or after the voice from the television is finished in CW:XM. So topic A looks like the ‘mutant question’ issue with tokens like ‘x-men’ and two times ‘sentinel’, even though ‘mutant’ itself isn’t among the high-scoring tokens. Topic B, on the other hand, makes less sense (Kitty Pryde only appears in CW:XM, so that ‘kitty’ occurs in merely 2 of the 6 documents), and its highest percentages are also much lower than those in topic A. Maybe this means that there’s only one actual topic in this corpus. Topic 0 at least associates ‘x-men’ with ‘mutant’, but then again, ‘sentinel’ is assigned to the other topic. Thus neither topic can be related to an intuitively perceived theme in the comics. It’s clear how these topics were generated though: there’s only 1 document in which ‘sentinel’ doesn’t occur, the first half of the CW:XM excerpt, in which Valerie Cooper is interviewed on television. But ‘x-men’ and ‘mutant’ do occur in this document, the latter even twice, and also ‘know’ occurs more frequently (3 times) here than in other documents. So the results from Mallet and maybe even my own Perl script seem to be correct, in the sense that the LDA algorithm has been properly performed and one can see from the results how the algorithm got there. But what’s the point of having ‘topics’ that can’t be matched to what we intuitively perceive as themes in a text? The problem with our two example corpora here was, they were still not large enough for LDA to yield meaningful results. As with all statistical methods, LDA works better the larger the corpus. In fact, the idea of such methods is that they are best applied to amounts of text that are too large for a human to read. Therefore, LDA might be not that useful for disciplines (such as comics studies) in which it’s difficult to gather large text corpora in digital form. But do feel free to e.g. randomly download texts from Wikisource, and you’ll find that within them, LDA is able to successfully detect clusters of words that occur in semantically similar documents. These four issues constitute a story arc of their own (titled “Incarnations”), the end of which is also marked by Greg Smallwood’s return as the sole artist from the next issue on, so it makes sense to review them now. Previously in Moon Knight: Moon Knight has escaped from the mental asylum but then met his patron god Khonshu, fell out with him, jumped from a pyramid, passed out and awoke in his Steven Grant persona. He is producing a film starring his girlfriend Marlene as the female lead. Everything seems fine and the last panel of issue #5 shows a smiling Steven. And here his troubles begin. Our protagonist keeps involuntarily changing in and out of his identities, and his surroundings change with him. Everywhere he is haunted by incarnations of his tormentors at the mental asylum, nurses Bobby and Billy and psychiatrist Dr Emmet. And also by werewolves from outer space. Neither Moon Knight nor the readers know which reality is actually the real one. The guest artists reduce the subtlety somewhat, but it is also an interesting gimmick that each of Moon Knight’s personas/realities is drawn by different artists: taxi driver Jake Lockley by Francesco Francavilla, film producer Steven Grant by Wilfredo Torres and Michael Garland, and space pilot Marc Spector by James Stokoe. So how exactly does this brilliant device of switching back-and-forth between identities work? Jeff Lemire employs a variety of ways to do this, but let’s take a closer look at the beginning of this arc in issue #6. The first panel (art by Torres and Garland) shows Moon Knight in his old cape fighting some villain in what looks like ancient Egypt. So far, this could be a classic Moon Knight story. In the second panel though, a speech bubble is partly obscured by a boom microphone, and on the following double page we learn that this was only a Moon Knight film being shot, produced by Steven Grant. The name of the leading actor though, whose face we never get to see, is Marc Spector – the real name of the real Moon Knight! On page 5, Steven and Marlene enter a taxi and talk about a fundraising event at a mental hospital (because their film “explores some real themes… identity, mental illness”), which of course later turns out to be the hospital where Moon Knight was detained earlier. The last panel on this page contains a caption: “Steven Grant is too soft for what comes next…”, and on the next page (from now on drawn by Francavilla) their taxi driver turns out to be Jake Lockley! After he has dropped Steven and Marlene off, he meets his friend Crawley, who remembers the events from the first arc (the escape from the mental hospital) but Jake can’t. Marlene answers, “Have you been taking your meds? […] You remember last time you got off, how you got.” So (according to this version of Marlene) Steven is mentally ill, which would explain the Jake Lockley scene as Steven’s delusion. But Steven doesn’t even remember being on medication at all. And so it goes on. It’s a joy for the reader to gradually realise on how many levels the various realities are intertwined, and how they all contradict each other. Until issue #9 when Moon Knight, in his Mr Knight outfit and drawn by Greg Smallwood and Jordie Bellaire again, confronts his other three personas, defeats or makes peace with them, and they vanish. The “Incarnations” story arc was one wild ride, and if Lemire, Smallwood and Bellaire keep up their good work in the next arc, Moon Knight will surely be the best current Marvel comic, now that The Vision has ended. Arjun Appadurai’s Modernity at Large – in comics? Arjun Appadurai’s book Modernity at Large. Cultural Dimensions of Globalization was published in 1996 but is based on texts written around 1990. Its core is the chapter, “Disjuncture and Difference in the Global Cultural Economy” (27-47), first published as a journal article in 1990. Thus it can still be seen as a continuation of the discourse on postmodernism/postmodernity from the 1980s (as reflected on this weblog by the series of posts on texts from 1980 to 1985). The new element that Appadurai brings to the postmodernist discussion is globalisation: his aim is “to construct what John Hinkson calls a ‘social theory of postmodernity’ that is adequately global” (47), although Appadurai usually speaks more often of “modern” when he means the present day. The important point, though, is the rupture or paradigm shift that he suggests to have occurred around 1970: “it is only in the past two decades or so that media and migration have become so massively globalized, that is to say, active across large and irregular transnational terrains” (9). ideoscapes, i.e. “meaning-streams” in “the discourse of democracy” (37) and other ideologies and concepts. It would be easy to apply this framework to comics as commodities, i.e. comic books, TPBs, tankobon etc., the production and reception of which are nowadays almost always transnational processes. But are these global cultural flows also reflected in the content of comic stories? While this is not meant by Appadurai as a characteristic of postmodern cultural works, it is not far-fetched to expect that postmodern works are more likely to reflect a global cultural economy than previous ones. ethnoscape: the series is about the ‘synthezoid’ Vision having created an artificial family – wife, daughter and son – and moving into a house in Arlington, Virginia. This, and their difficulties of settling in among humans, are of course metaphors for transnational migration and xenophobia. 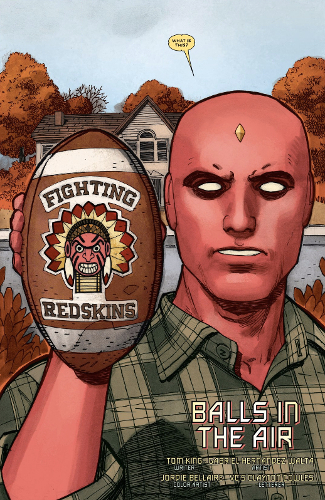 But there is also proper migration represented or at least implied in The Vision: in #4, the children, Vin and Viv, play with a football that has “Fighting Redskins” and a caricature of a Native American printed on it. It’s the mascot of their high school, they explain to Vision, and only recently has it been changed to the “Fighting Patriot”, a politically correct “colorful bull in a three-corner hat”. This little episode brings to mind that naturally, there are only few Americans whose ancestors were not transnational migrants. Then there are characters in this comic who represent, through their name and/or appearance, more recent immigration waves than the Mayflower – Leon Kinzky, the Asian-looking Matt Lin, and Marianella Mancha. Her son Victor Mancha even draws a connection between himself and the Spaniard Don Quijote de la Mancha on the sole basis of their names (in #8). Finally, there is a long quote from Shakespeare’s The Merchant of Venice about being Jewish. mediascape: specifically, Appadurai means electronic media such as television (3, 35), so the play The Merchant of Venice first shown as a hardcopy book in #5, though written in England, doesn’t count. Although there is some talk of “downloading” and “uploading” things and some smartphones are shown, there are few instances of content being electronically mediated across national boundaries. One example is Vin “downloading Bach’s cello concerto” in #3 – while we are not told where the recording was made, at least the composer is German. technoscape: a series with androids as protagonists is bound to feature lots of high-tech machinery, but the sources of all these gadgets are Ultron, Vision and Tony Stark – so I think it’s all ‘made in USA’. No transnational flow here. 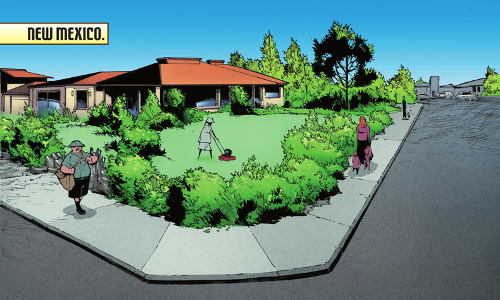 financescape: in the beginning of the comic, Vision mentions his difficulties in getting a steady income, and Tony Stark, the embodiment of wealth in the Marvel universe, appears a few times. Apart from that, financial matters don’t play any role in The Vision, let alone transnational financial flows. 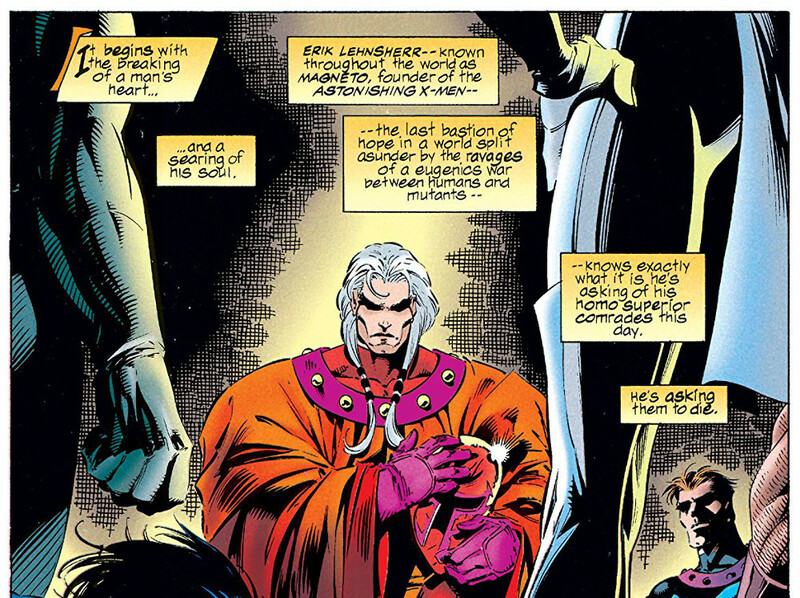 ideoscape: The Vision is quite a cerebral comic, but few ideas that can be traced back to outside the US are mentioned. In #9, however, Victor Mancha says: “Vin’s reading this book [The Merchant of Venice] over and over. Like he’s obsessed with mercy and justice.” So some ideas have travelled from England to America after all. To sum up, applying Appadurai’s framework to the content of a (supposedly postmodern) comic doesn’t yield as many representations of global cultural flows as I had expected. But, again, that’s not what it was intended for. Applying this framework to the para- and extratextual information pertaining to a comic, however, would surely reveal it as a product of Appadurai’s global cultural economy.